Teddy Roosevelt and his friends formed the Boone & Crockett Club in 1887 in an effort to promote conservation and to keep track of the best trophies in North America. As a celebration of that rich history and the newest entries in the world record book, B&C will be hosting it's 28th Big Game Awards July 17-20 in Reno, Nev. Among the trophies to celebrate at this year's Big Game Awards, there's a new world record Rocky Mountain goat, killed by Troy Sheldon in 2011, which scored 57 4/8 B&C. All told there will be about 135 new record book trophies at this year's event. The Big Game Awards — which started in 1971 — take place every three years and pay homage to B&C's high standards for conservation and fair chase, ethical hunting practices. As Roosevelt himself claimed, wise conservation practices lead to conscientious trophy production. The more trophies, the better those practices are working. Interestingly enough, trophy record keeping was initiated by B&C back in 1902 to help tangibly track the success or failure of conservation practices. It was also a way to get sportsmen interested and involved in conservation rather than working against it. And as sport hunters transformed into conservationists, Roosevelt also insisted that ethical standards — what we now call "fair chase" hunting — were necessary to distance sportsmen from market hunters who carelessly decimated entire species. What began in 1902 has now become the spoken language of today's sportsmen, as B&C scores are recognized everywhere as a standard in hunting, not only for animal size but for successful conservation efforts. With trophy production better than ever in most parts of North America, it's a living testimony to the success of Roosevelt's dream for B&C. The 28th Big Game Awards stretch out across three days and include a welcoming reception, hunting seminars, a recognition dinner for B&C scorers, a charity auction and the awards ceremony itself. In addition, nearly 200 youth and their families were invited to the 2013 ceremonies. To help get the 28th Big Game Awards off to a great start, we've teamed up with B&C to give away a couple of great prizes. 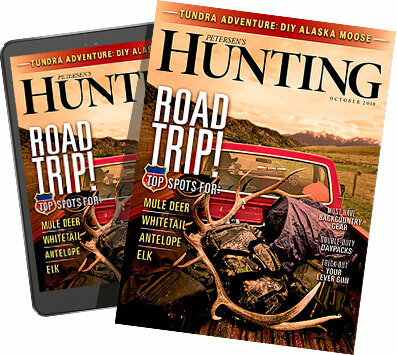 All you have to do is submit your guess for the score of the buck above and we'll give the first two closest participants a copy of Records of North American Big Game or Measuring and Judging Big Game. Submit your guess in the comments below.